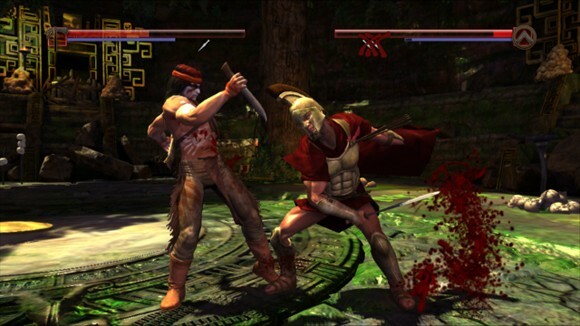 Deadliest Warrior is a fighting round game based off of the Spike TV show that will appeal to fans of violence. You can decapitate foes and cut off their limbs, in the process making interesting fights. When you lose an arm your warrior can still fight, but you better hurry and kill your opponent because you will eventually die from the blood loss. If you get hit in the leg you’ll limp around losing your agility that you once had. As you can see an mistake in a fight can be…well..deadly. All fighters have projectile weapons. The Pirate has a Gun, the Ninja has a Shuriken and so on. If you time the projectile right you can get an instant kill on your enemy. Nothing is more satisfying in this game than having a fighter charge you at full force just to get a Spear lodged in between his skull. D.L. has extra modes that you can unlock. After beating the arcade mode with everyone, there’s two survival modes. One that you would expect, and the other, where any hit you connect with will instantly take off your enemy’s limbs from him. Upon impact it will kill them but the same rules apply to you. It’s a very challenging mode but fun and gruesome. Another mode has you slashing Animals just like the TV series. In this you need to do it before the time expires. Reminds us of the bonus stages on street fighter. Nice extra stuff that DLC games usually do not provide. While the game has only 8 fighters at this time, Ninja, Samurai, Viking, Pirate, Spartan, Centurion, Apache and a Knight, (more are coming through DLC) they all fight completely different. Were talking about combos, blocking, evade moves, everything. This 10 buck fighter has you covered in that aspect. The learning curve is pretty solid, but if your new to the game I recommend setting the game to normal, because the A.I. doesn’t let up. There is actually a good amount of ways to approach combat. 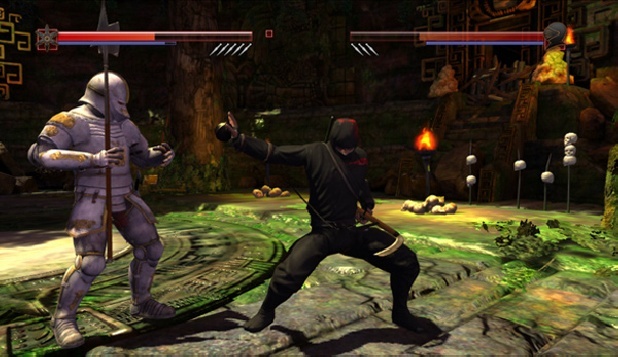 They have fatality-like moves that can be landed by hitting all 4 attack buttons. While the fatalities aren’t seeing Mortal Kombat, the cutscenes are still satisfying to watch. There are not many stages in this game and while I really like the fight lab level because it mirrors the show’s to a tee, the other levels are pretty bland for the most part. Poor design and lacking a decent color palate. The online runs pretty smoothly, I haven’t been in a laggy room yet. The game has a player match, ranked and tournament mode which is similar to SF4’s. You gain Battle Points from victories, you lose them from losses. Very straight forward. For me, any fighter these days retail or not needs to have a least a 4 player lobby. 8 would be ideal but at least 4. Deadliest Warrior doesn’t have any but a 1 on 1 mode. This game has a lot of strategy laced beneath it. Fights are always unpredictable and violent. Get hit a little bit, you die. 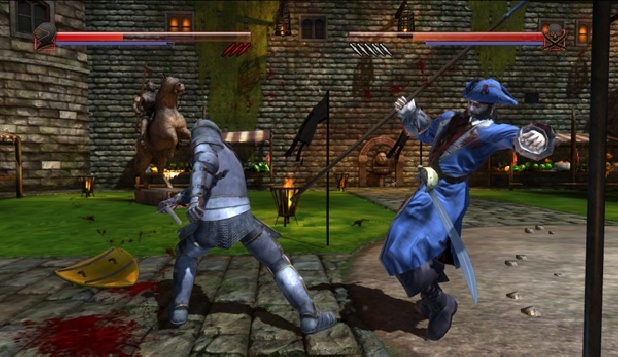 Reminds me of Bushido Blade (Wow we need a Ps3 update Now!). For a Download title I can recommend it. 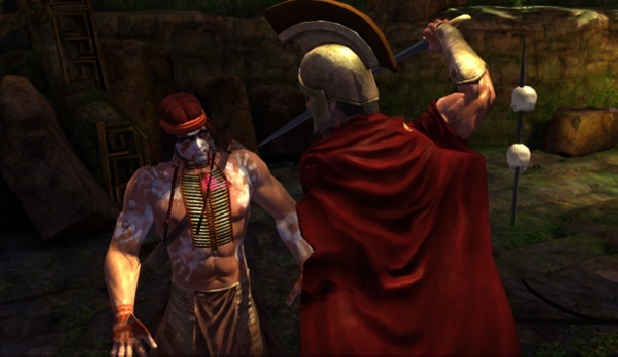 If you like violent games or just a solid fighting engine deadliest Warrior is your game. The problem lies in the lack of characters and stages.